Know your limits. Whether you’re planning a multi-day hike or a canoe day trip, it is important to be aware of your physical abilities and limits before you head out. 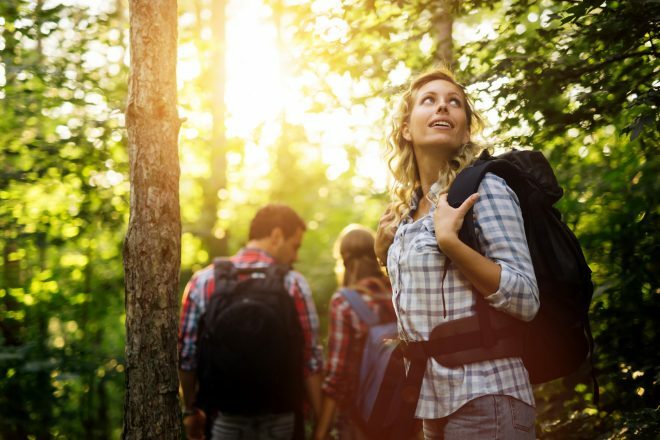 While hiking is one of those activities that you can start doing without any prior experience, not all trails are created equally. Knowing your limits and staying within it (especially if you’re new to the activity) will help you stay safe. Overdoing it can make you more prone to injuries. Invest in the right gear. Your gear can make or break your experience. Some investments are worth every penny. If you’re getting into more technical outdoor pursuits, proper gear is essential for your safety. A good place to start is to invest in a solid pair of shoes. There are many different types of outdoor shoes, and outdoor gear shops could help you decide which pair is right for your needs. In general, your shoes should fit properly and have the right support. Those sneakers may seem comfortable for walking in the city all day long, but they won’t be a match for uneven or slippery terrain. If you’re doing a multi-day hike, you would literally be carrying everything you need on your back. Investing in a good backpack is paramount. Make sure you get a proper fitting backpack. When buying a backpack, try it on in the store. Most stores will have weights on hand so you can see how it feels. Ask the store staff for assistance in adjusting the backpack properly. A good fitting backpack transfers the load to your hips (as opposed to pulling down on your shoulders). Make room for creature comforts. While there are many things to be said about packing light, having a little room for some creature comforts won’t hurt you (or your back, but just don’t overdo it). Don’t bust out those lawn chairs or air beds just yet (unless you are car camping, then by all means, go for it). If you have to carry it, definitely think smaller — perhaps a small inflatable pillow to avoid straining your neck, or a thicker sleeping pad that’s only slightly heavier. There are even gel seats for canoeing or portable folding stools so you’ll always have a comfortable seat whenever or wherever you may need it. You could even bring a golf ball to help massage those tired feet after a long day of hiking. If it helps make the experience more comfortable and enjoyable, and it only adds a pound or two on your back, it might be worth considering. Prepare your body for the hike. Exercising regularly helps condition your body for strenuous outdoor activities. Your plans and your current fitness level will indicate how much conditioning you still need to do. So, if your lifestyle is more on the sedentary side, it’s a good idea to start doing smaller trails, even if it’s just around your neighbourhood. Even taking the stairs instead of the elevator will help you tackle those elevation gains better. Welcome breaks and stretch. Outdoor recreation isn’t all about the physical pursuit. Spending time in nature is good for both body and mind. Take the time to stop and smell the roses. It will lift your spirits, and give your body a chance to recover a bit. Rest periods look different for every person. Similar to knowing your limits, you’ll be more familiar with the types of breaks that work for you the more experience you have. Some people may prefer half-hour breaks every few hours, while for others, stopping for a couple of minutes every few kilometers work better. Whatever it may look like for you, take that opportunity to stretch those muscles as well. Plan for after the adventure. Recovery doesn’t end when your adventure does. It’s a good idea to have a couple of things lined up to help your body recover. Rest should be top of your list. Skipping the gym after a five-day hike isn’t a terrible idea. Give your body sometime to recover to prevent injuries. Maybe opt for a restorative yoga class to help elongate and realign your body instead. You might consider a visit to your chiropractor to help your body recover from the stress of carrying 40lbs of weight on your back.